USA – 12/22/2016 (PRESS RELEASE JET) — Philip Michael has won 2 major awards at the Urban Action Showcase in New York. The awards were for Best Action sequence and Best Hand 2 Hand Combat sequence on November 12th in New York for, Control. But first of all, who is Philip Michael. If you ever watched any musical broadway shows around the world there is a famous musical based around the music of ABBA. That is correct, you guessed it, Mamma Mia. It was developed into a delightful apertizing movie starring Meryl Streep, Julie Walters and Christine Baranski. For anyone into theatre in New York, the name Christine Baranski would certainly stand out. Christine had dymnamic chemistry with Philip on screen. ‘Does your Mother know” was the hugely famous dance number with Philip as Pepper and Christine as Tanya. Philip is also a very popular name in Dublin Ireland due to his successful role as Joshua Udenze in Dublin’s finest Soap “Fair City”. Philip was the Lead Actor/Hero in Control which additionally Philip also fight coordinated. So this achievment gives him great honour as the on screen hero and off screen fight director. Along with his on screen presence was Christian Howard who played Ken in the recent Street Fighter Legacy series. Success seems to resonate with other forms of succes as Philip’s of screen development for control included Joey Ansah (Bourne Ultimatum, Street Fighter: Legacy) as his 2nd unit fight consultant, utilising Joey as a constructive critic for the devising of the fights. Control was written and directed by N.G Bristow who designed the script specifically utilising Philip’s martial arts and acrobatic theatrical performance. To describe Control, N.G. Bristow states “It is as a mash-up between The Matrix and Shameless!” . Very interesting and intriguing woirds that have certainly made its mark in the 2016 festival circuit. 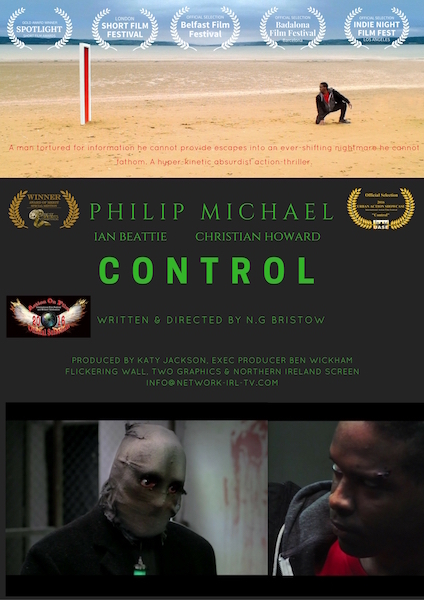 This is the 5th award received for the Team of Control including winning at the Action on Film Festival 2016, Best Shorts Awards and Spotlight Film Fest. Towards the end of 2015, Philip was on his way back to his home in Hollywood after an evening with close associates. Philip parked on the side street as he often does on a busy weekend evening. Philip stated that he was feelin “uncomfortable” about the spot he located and it took him a few minutes to decide that was the place he was going to park. After finally deciding this was the place he would leave his Camaro he stated he felt “settled and a desire to turn around”. As Philip turned he saw a man approaching him, 6 foot 2 inches with green long janitor style clothing and goggles like Vin Diesel from Pitch black. The man walked extremely fast towards Philip and said “Hey, What’s up Papi”, he then pulled out a gun with the aim to carjack Philip. At that moment Philip leaned back and gave him an incredibly powerful sidekick to his chest. Philip said “that is when I actually realised and saw his gun in his right hand. Initially he was just too close to me so my right leg just reacted. I stepped back and thought either jump behind my car or move in and stop him completely. I decided to move in but he turned and ran off” . As philip made the decision to defend himself he explained that the car jacker was struggling to breath and could not lift up his arm therefore ran away. Philip later explained the scenario to the police who were astonished. Apparantely the man was with another gentleman who had already robbed one gentleman and stole his car. This man that then approached Philip first, after his partner in crime took the first car, went to ralphs supermarket and attemted to car jack a lady at the parking lot. Sources have it that he fired in the sky and beat the lady pretty bad but could not find her keys in her bag so he, in a panic, ran off and that is where, to his own destruction, found Philip on the side street. Was the uncomfortable feeling Philip had a divine intervention? Philip seems to think so. He states “I feel as though the need to wait by my car was to make me stay and encounter this guy. It was at the perfect moment that I felt ease and turned around when I saw this guy come towards me. After I hit him I truly beleive he saw something because he turned and looked towards my right shoulder past my face and seemed as if he saw something but no one was there. I mean he could have just aimed his gun but he just belted it. I considered maybe he saw a guardian angel. The cops’ theory was that I kicked him so hard it may have dislodged his shoulder girdle fafter breaking his ribcage so he could not lift up his arm. Sounds nice too, but a couple of days ago i was walking to my car, and i like to pray as i walk sometimes, but these words came out. “The lord is the strength of my life of whom shall i be afraid. Even if he has a gun in his hand.” I didnt know why those specific words came out of my mouth till 2 nights after”. As you may have gathered, Philip is a strong man of faith as he claims and certainly a factor to the successful mentality he has in his work and in his life. We hope to see more of his action on screen and less life threatening scenarios off screen no matter how heroic it may seem.